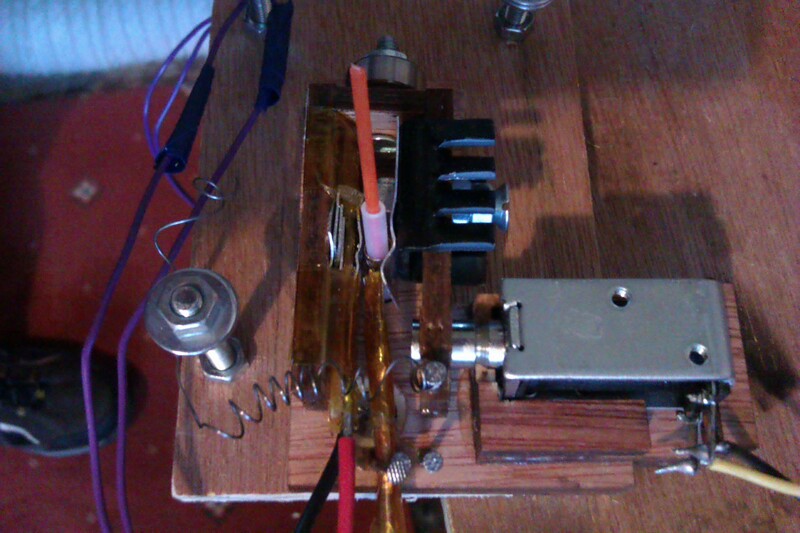 For a long time I’ve been meaning to couple the laser beam to the reprap. Recently the PC driving the laser died giving a perfect excuse to turn my Prusa Mendel into a laser printer…ahem cutter! 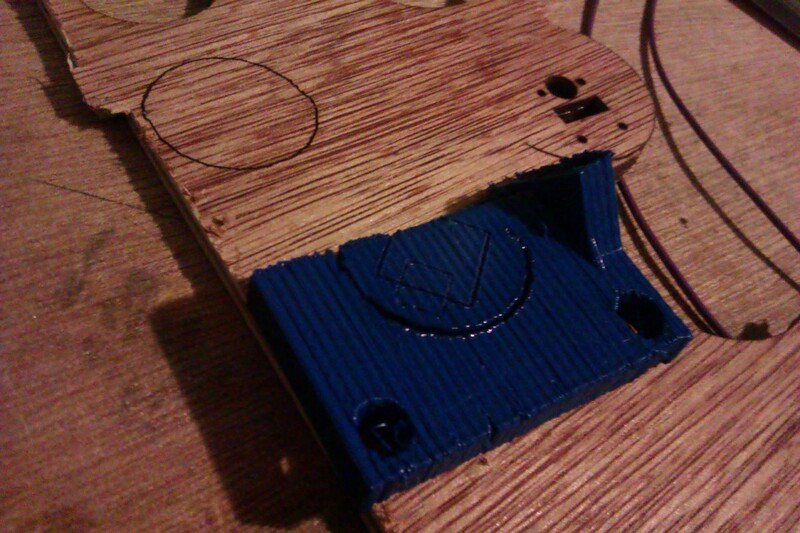 First up is to divert the beam towards the reprap using a laser mirror and through a hole cut into the laser enclosure. 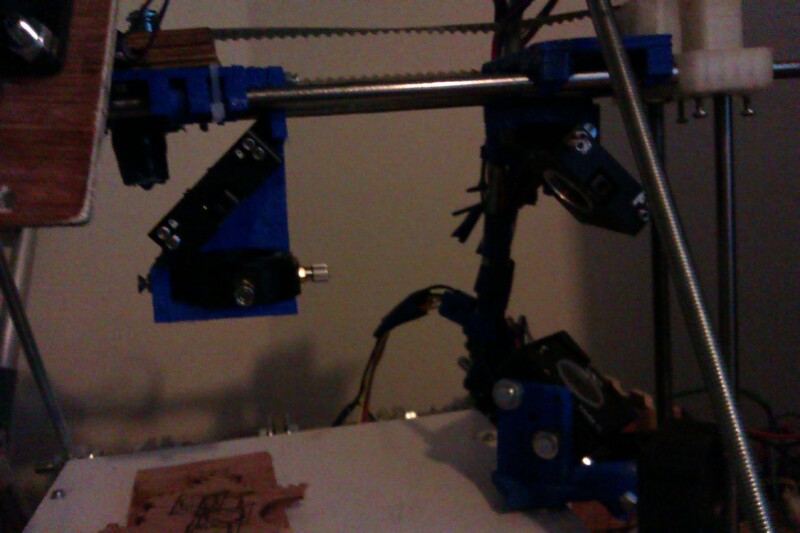 Guiding the beam around the reprap is a little trickier. I opted to rotate the printer 45 degrees wrt the beam and put a mirror (M1) under and to the left of the x-end-idler to direct the beam vertically upwards to the x-axis. Then another mirror (M2) steers the beam to the left along the x-axis towards the x-axis-carriage where I’ve placed the last mirror (M3) which steers the beam vertically down through the focusing lens and onto the workpiece. Unfortunately this setup did not leave enough z-axis travel to get the beam well focused onto the print bed even with the extruder removed from the x-carriage. The laser can be set to gate on with a 5 V TTL signal and pulse at its own internal rate. This means that M106/7 (fan on/off) can be used to gate the laser. Since the output from the RAMPS board driving the fan is 12 V I used a 10k pot as a voltage divider to feed 5 V to the laser. I had a quick look at SFACT for generating g-code but I didn’t have any success. I found that bdring previously had some of the same electronics and software issues. 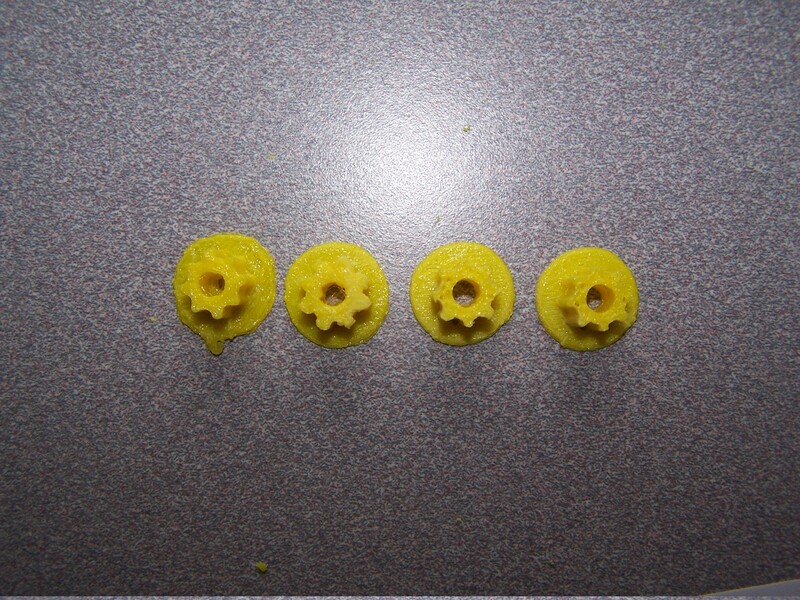 He modified a python script called cam.py to generate gcode for a reprap-controlled laser so I used that. It struggles with anything beyond simple shapes but is sufficient to get started. I use Qcad for drawing dxf or openSCAD can be used to dump a section of an stl to dxf. Apologies for having to turn your head 90 degrees, I’ll do a better video in a day or two, darn smartphone camera! The faint spot visible before things kick off is a low power CW (not pulsed) guide beam. 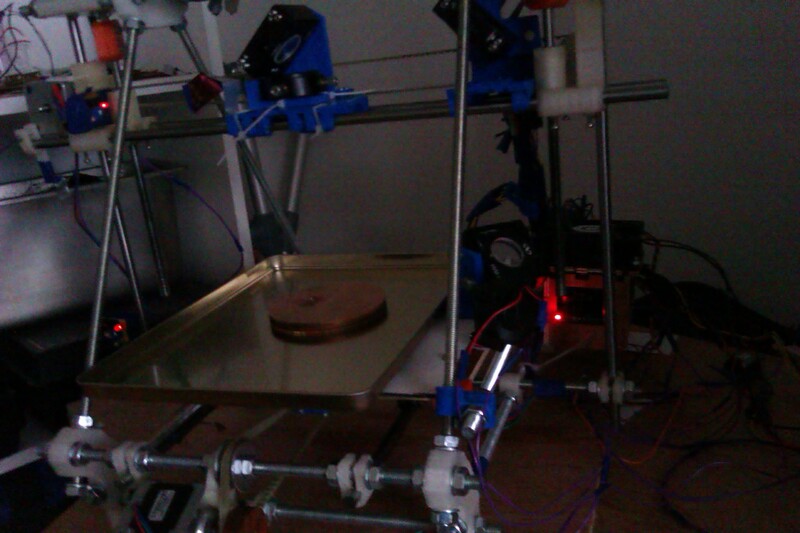 The shiny upturned biscuit tin lid is there to stop the beam from punching through my dibond print bed! Black anodised aluminium would be better for eye safety but there was nothing suitable to hand. Theres a lot of fluorescence visible wherever the UV beam leaks through/off the mirrors but I was wearing suitably rated laser goggles of course! The setup cuts well enough but there is backlash on the x-axis due to slightly loose fitting printable lm8uu bushings which allows the carriage to lift ever so slightly at direction changes (like a see-saw). It has the same effect as backlash even though the belts are nice and taut. I need to print new ones. The effect of backlash can be seen but the cut is clean. 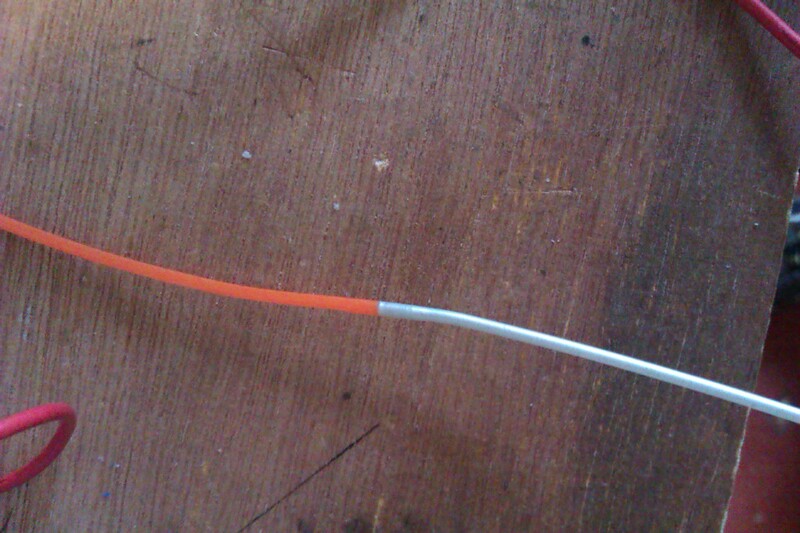 I’m planning to get a laser diode, either infrared @ 808/975 nm or Blue @ 405/445 nm or both, probably fibre-coupled. This would do away with the need for all those mirrors taking up space and reducing the ‘print volume’ available. The laser could be neatly off to the side with all the electronics and the optical fibre would connect it to a small lens assembly (which I plan raytracing) on the x-carriage, essentially another ‘tool’. I’ve been looking at suitable driver circuits (laser diodes need constant current and are sensitive to spikes) but I’ll post more on that when I’ve settled on a decent circuit / laser diode / optics. 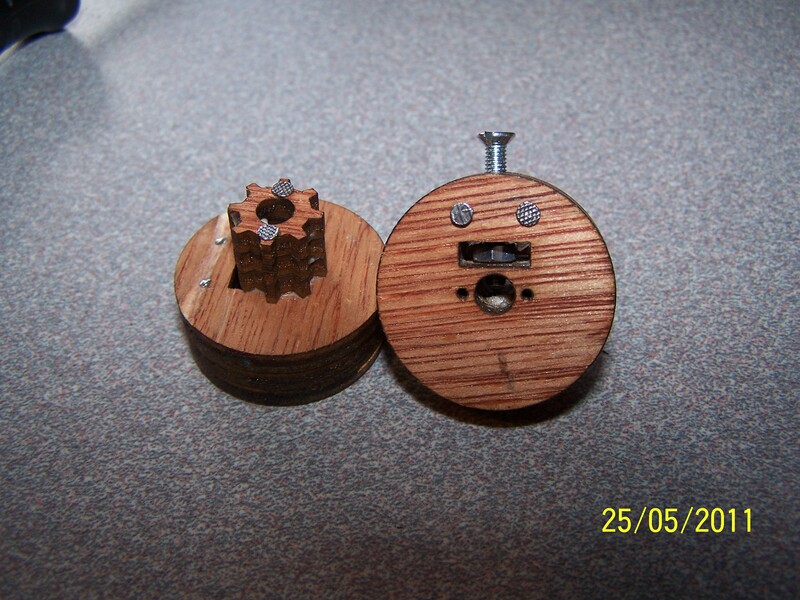 If it all works maybe I should sell a few RepRap laser kits to cover my costs! 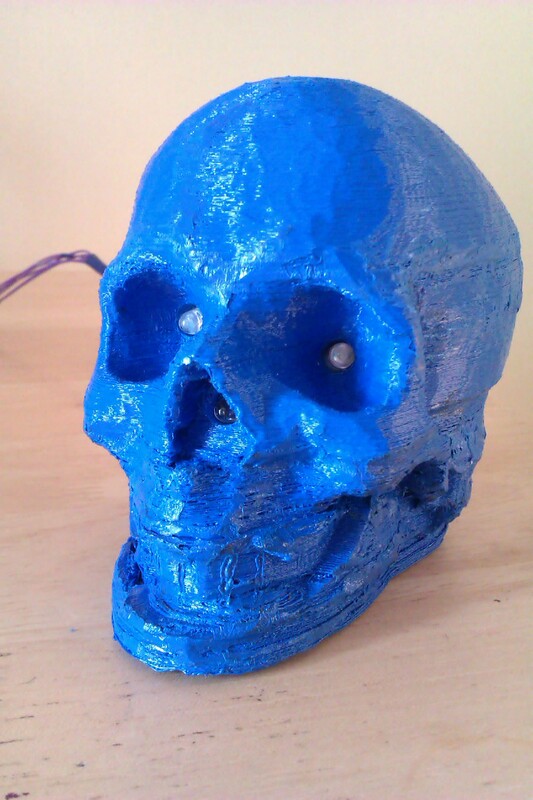 For Hallowe’en just gone I printed out an Elvis Skull with blue PLA from Ultimachine. I had some trouble with missed steps early on due to my SFACT not being well calibrated and causing the printer to push out more filament than needed… but I tried to correct the position a few times… with mixed results. Nevertheless it was usable so I drilled out some holes in the eyes/nose and popped in some blue LED’s that were lying around. I had modified the arduino fade sketch to control some laser diodes so I put it to use to make the LEDs glow in a slightly spooky fashion. The kids loved it! The no of pulses, their ramping up/down and 'full-on' times can be set. I imagine there are neater ways to code it but it does the job. I’ve been messing with controlling it from an Android smartphone using Python (SL4A) and a bluesmirf bluetooth module. More on that in a future post. 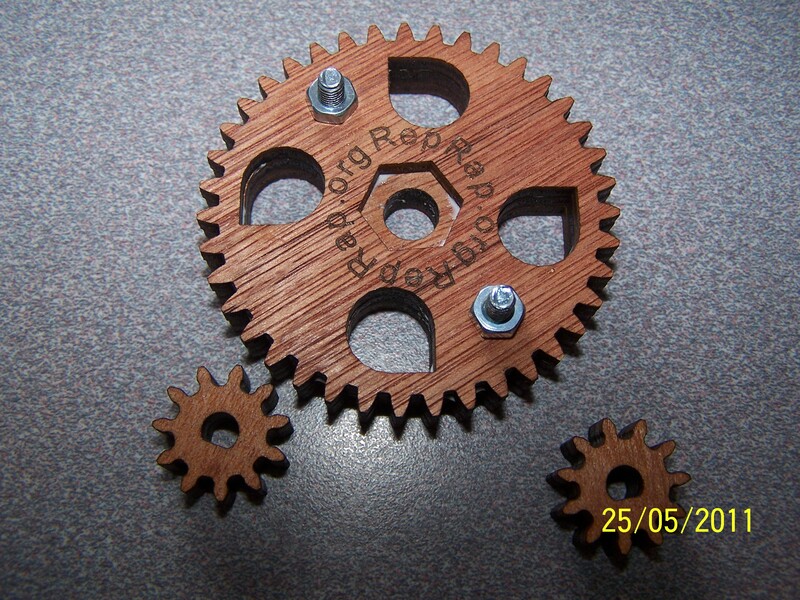 Over the summer Richrap came up with a nice way to do multicoloured printing by joining filament. At the time I figured that automating it would be pretty cool so I did a few quick welding experiments but between one thing and another I haven’t looked at it since. Anyway I decided to take some photos/video and pop it up here in case anyone finds it useful. 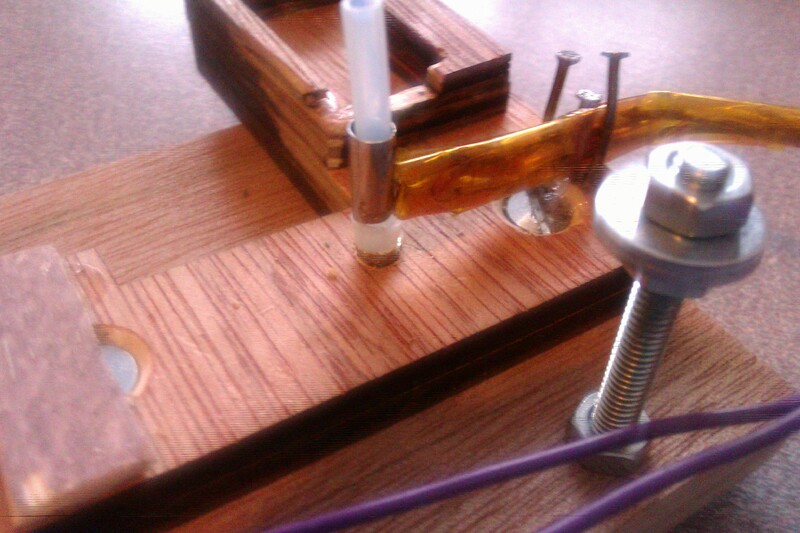 The two main approaches I tried were with lasers and resistors. The first thing to do is to heat the PLA in order to weld it. For this I soldered a bunch of SMD resistors in parallel onto some stripboard (18 x 120 Ohms giving 6.6 Ohms and almost 22W @ 12 V). I covered the lot with kapton tape and then taped some thin aluminium strip on to conduct the heat out of the resistors. This was then in contact with an aluminium tube which had a PTFE liner (same as Adrian’s recent RepRap hotend designs) within which the PLA sections to be joined meet. This is the heater and I connected it to my RAMPS setup and set the temperature to 160C for welding as per Richrap’s blog. It works pretty well and is repeatable with decent quality but at the moment takes over a minute to get to 160 C and then back down to 60C (glass transition for PLA…. maybe I could move things at a higher temp?). 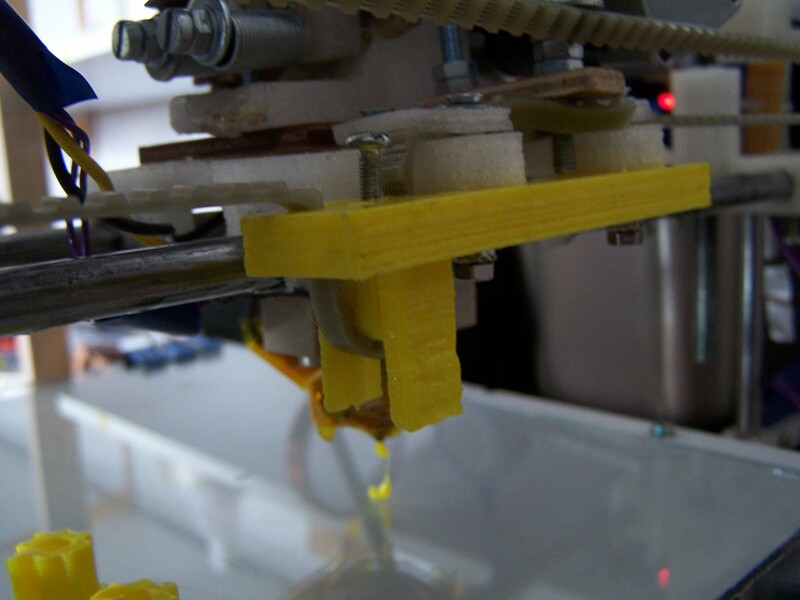 Also, I have to push the filaments together a little by hand – a feeder system could do that easily and more reliably! Photos below. Note: the ‘housing’ is a bit of a messy hack job and leaves lots of room for improvement! 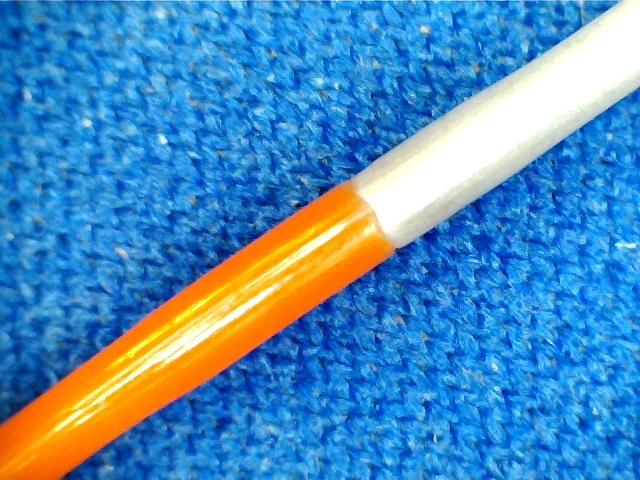 Al tube on PTFE liner. 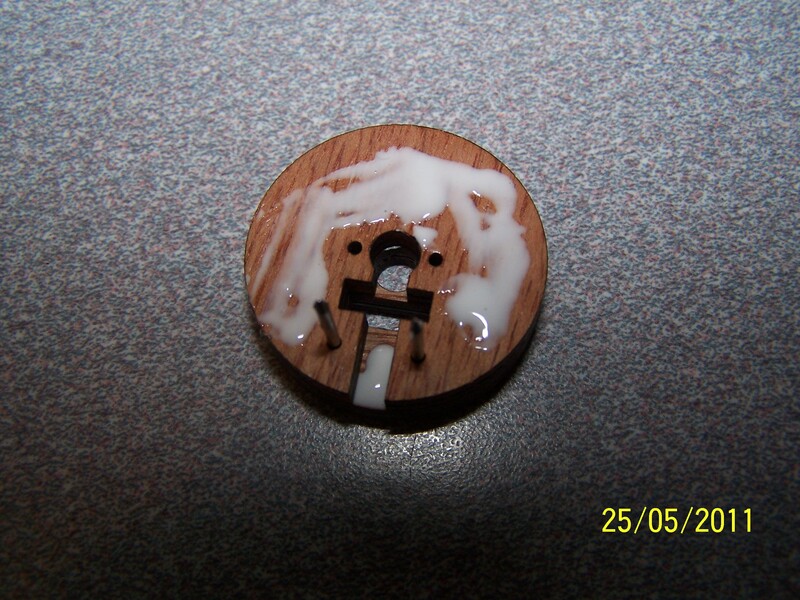 Theres a small section of larger PTFE under the Al to stop it slipping down and separate it from more Al which is inserted into the wood. Another idea is to have a longer Al piece but drill holes in it to prevent heat conducting away from the melt zone, both work. 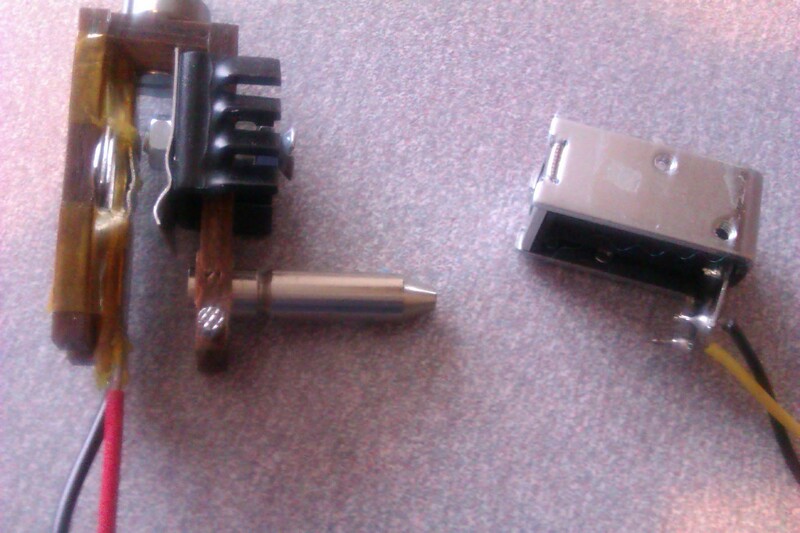 The crude spring loading is for returning the solenoid/heatsink to the cooling position. Theres room for improvement but results aren’t bad. The join is a little ‘fatter’ than the rest of the filament because the PTFE tube has a 2 mm id and the filament is normally 1.75 mm od. 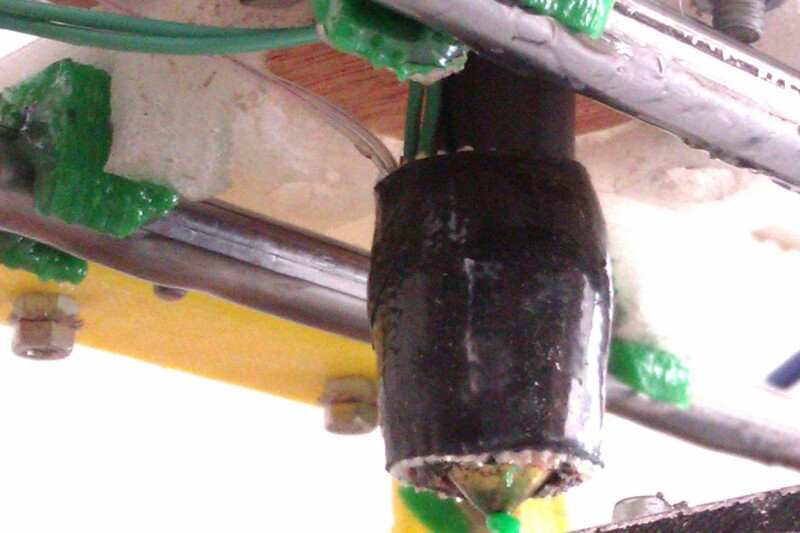 So as I push the filaments together to apply pressure to aid the weld…. the join expands to fill the PTFE tube id. 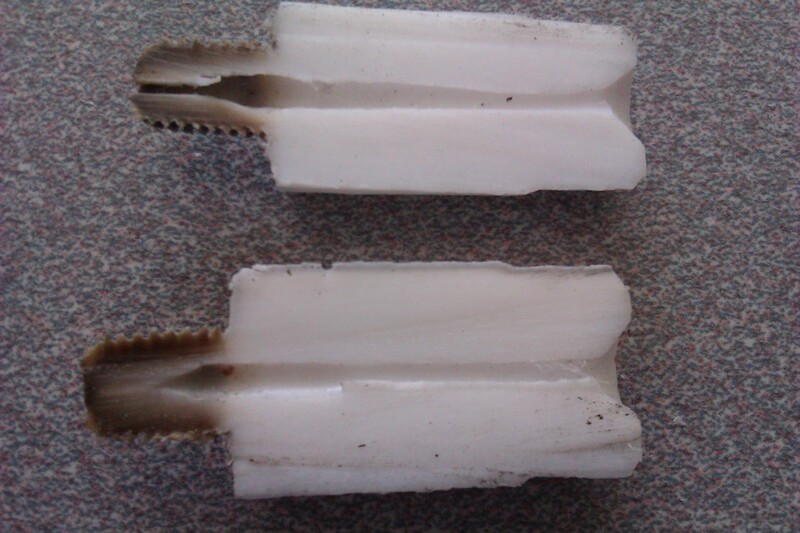 Since the liner is PTFE it usually slips out easily. Usually the 1.75 mm hotends have 2 mm id going down to the hotend (to allow variation on filament od I guess) so it should go through the extruder ok… but I’ve not tested that yet. 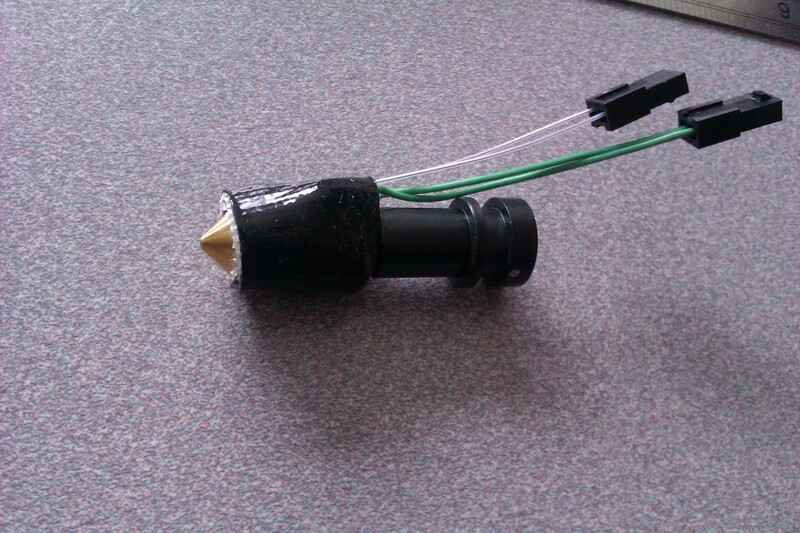 One thing to note is that the PTFE can expand but if its snugly fitting in the Al tube that probably shouldn’t happen. I figured this would be a little quicker as you are directly heating the filament so theres no extra thermal mass to heat/cool like SMDs and Aluminium. I’m using 3x 200 mW laser diodes at 808 nm running at ~ 100 mW outputs to (over)ensure I avoid pushing them beyond 200 mW and frying them. I used this circuit from instructables.com (recommended by the folks at laserpointerforums.com) but with a high value resistor instead of the zener. 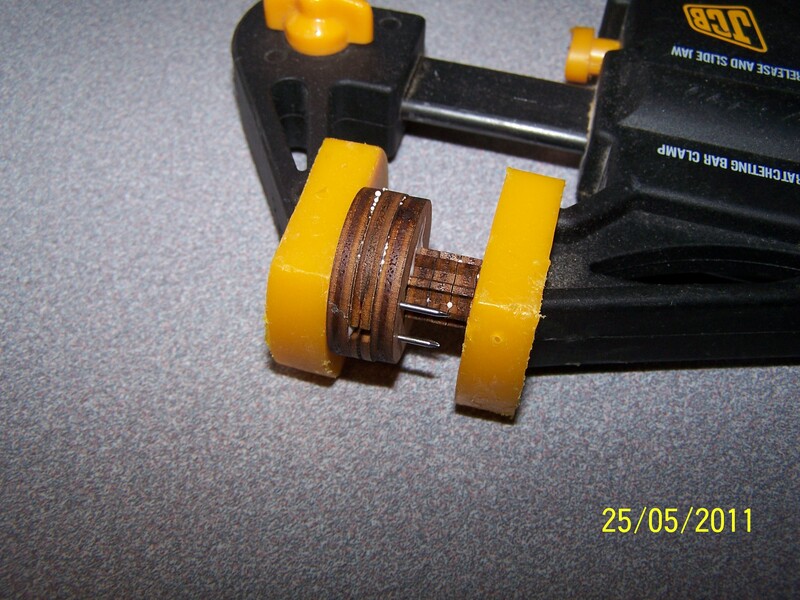 I borrowed the PTFE liner idea from the resistance version above as this keeps the filaments aligned! Results have varied greatly and this is mostly due to the fact that not having laser goggles for 808 nm I put everything into a box and can’t really get in there to push the filaments together, though more power would likely help too. So its a bit random and as such I haven’t been able to get reliable weld time info. I’ve tried spring loading the filaments but not very neatly. Maybe I’ll have another look at this in the coming weeks…. Since the last post, a while back, the hotend gave up. Initially it started leaking…. 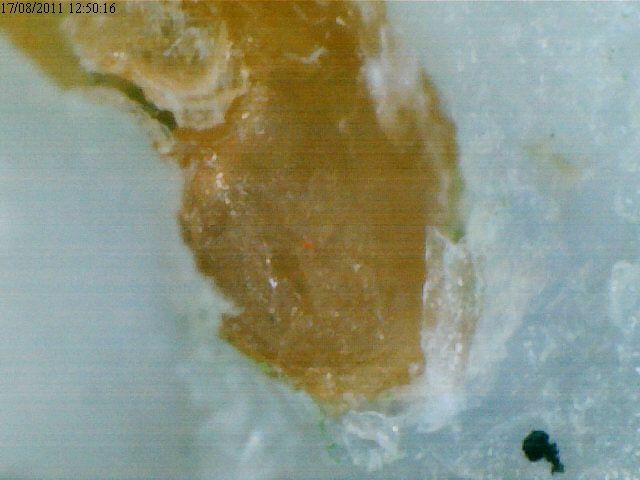 gently oozing pla out somewhere between the teflon and the brass. I took it apart and used sink/drain unblocker fluid to clean the pla out (most came out with gentle heating first). I added an extra turn on the teflon barrier threads with a die so I could better tighten the teflon into the brass nozzle in an effort to seal any gaps that may have formed and put it all back together. 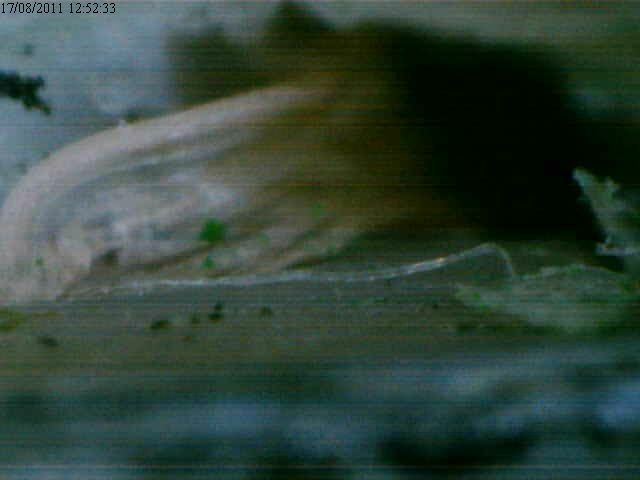 Unfortunately it leaked again quite soon afterwards so I repeated the process a second time. Pretty soon it was leaking again. This had the effect of putting down ever so slightly less plastic than skeinforge anticipated and so the top layers were a shade sparse. In any case I rightly or wrongly I continued printing… but not for very long…. a couple of days at most. 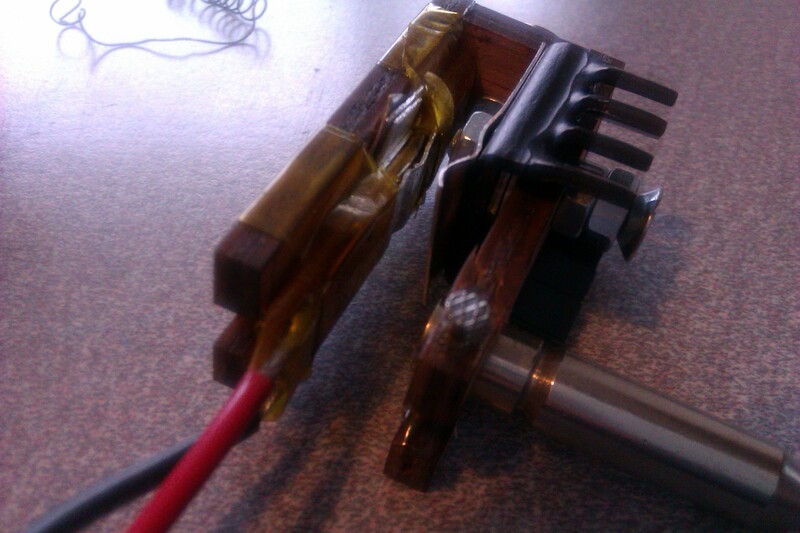 Then the hotend just packed it in altogether. I opened it up again and the teflon was clogged so I drilled it out (forgetting I could just heat it in hot water!). 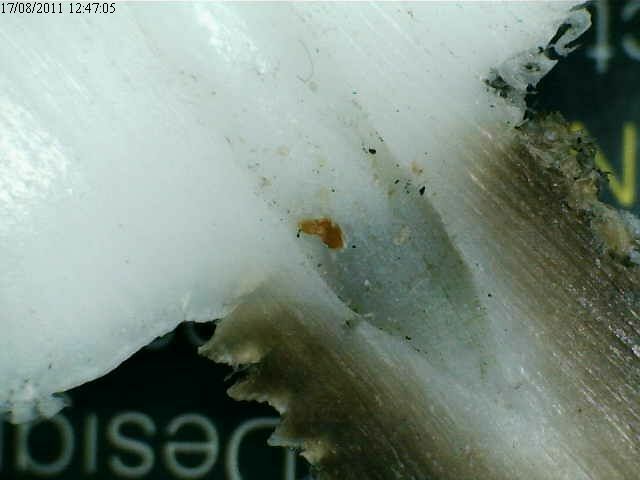 Anyway with a 2mm channel drilled in the teflon I could still see some pla in the walls of the teflon (at the time I was printing with some nice orange from Vik!). 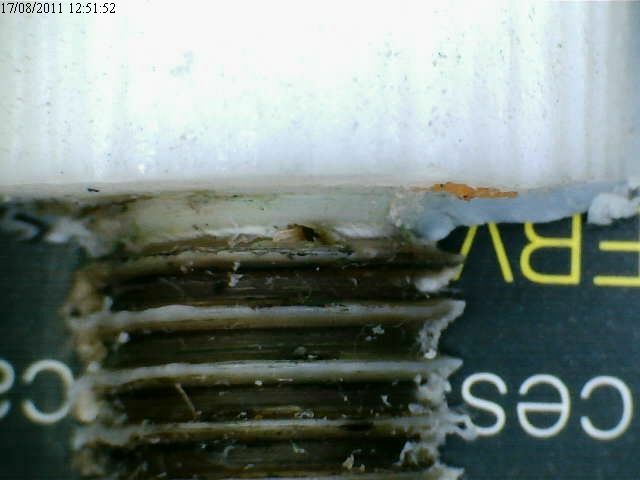 I reckon the pla had forced itself into the teflon and was actually leaking from there and not at the brass interface though I should really split the teflon down the middle to verify that. So I’d been hearing good things about Makergear’s hotend for quite some time and now being hotendless it seemed like a good time to get one. So I ordered a 0.35 mm nozzle superpack for 1.75mm filament, Makergear shipped the same evening and the kit arrived here (Ireland) a few days later. The first pressing task was to eat the free chocolate sample! Then down to the business of assembling the kit. This turned out to be pretty straightforward and all the instructions are on their website. I’ve been printing with this for a few weeks now and so far its been printing really well. I’m getting 60 mm/s out of it easily and I plan to push it a bit further and see how far it’ll go (the old hotend struggled beyond 30 mm/s). 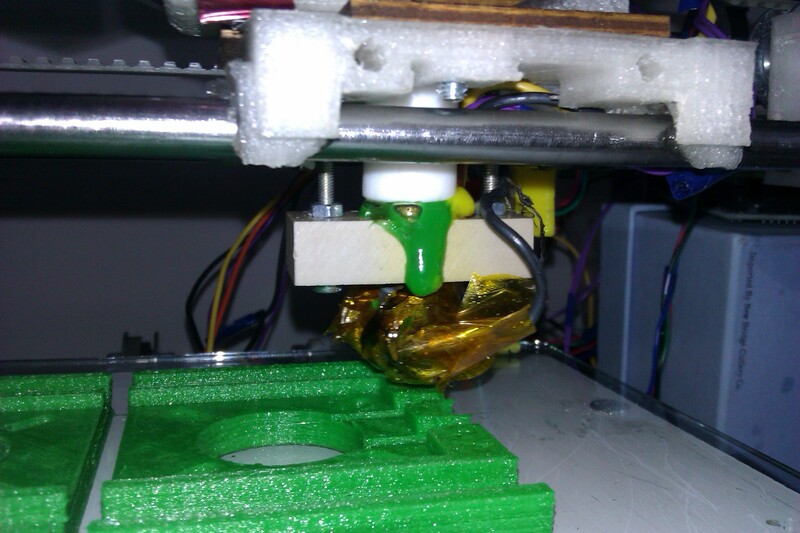 Generally most things print pretty well… with the exception of the small RepRap pulleys which need a lot of ‘cleaning’. I could feel some backlash in both pulleys when the motors weren’t powered up. 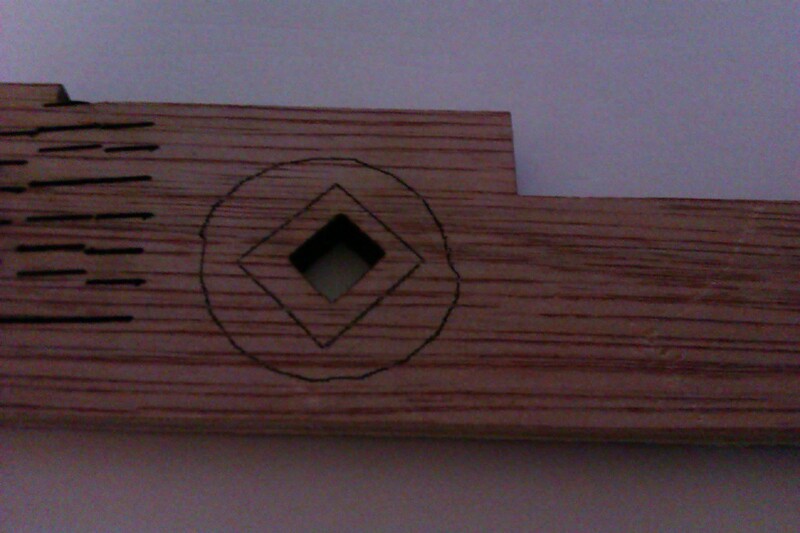 So, like other folks, I put a pencil on the nozzle and plotted an 80 mm diameter circle with fill. I used the lash option in SF 40 to compensate but pulleys looked a bit odd. So I designed up some crude adjustable belt tensioners in openSCAD which I could fit to both y-axis and x-axis without dismantling anything (except loosening the x-axis belt to fit the tensioner!). 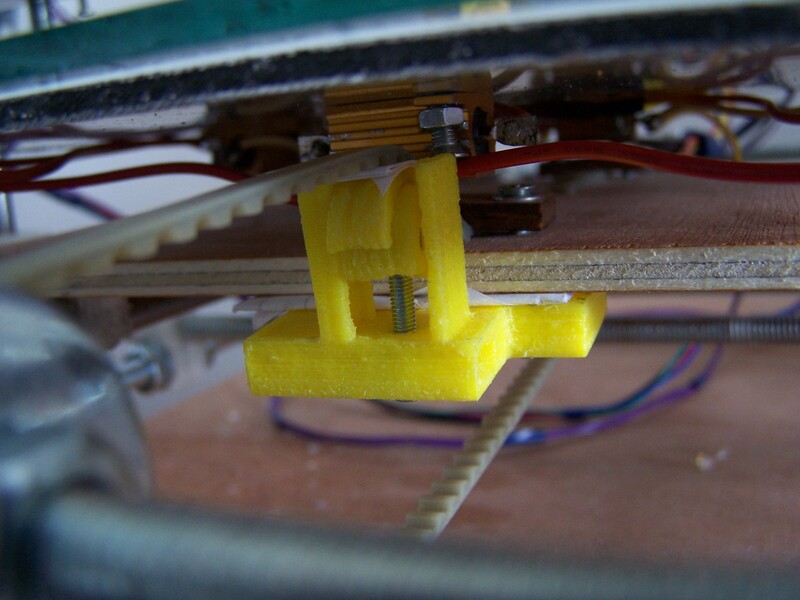 The x-axis one fits under the prusa x-carriage onto existing bolts and the y-axis one fits under the bottom plate using the belt clamp bolts. It mightn’t be that obvious from the photo but there is a decent improvement, although there is a bit more tuning to do! 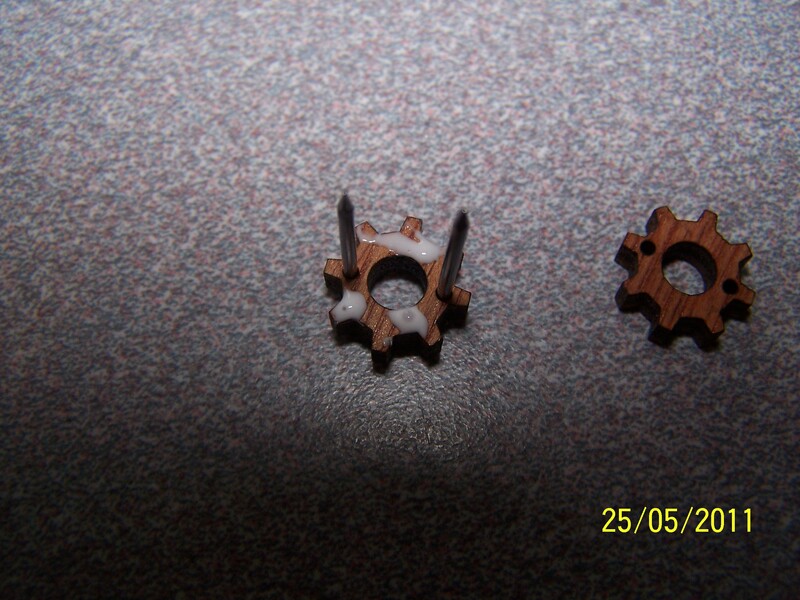 The repstrap I put together a few months back used laser cut gears to couple the steppers to the leadscrews. I printed some pulleys on it for the Prusa build but they weren’t precise enough. So I laser cut some instead! 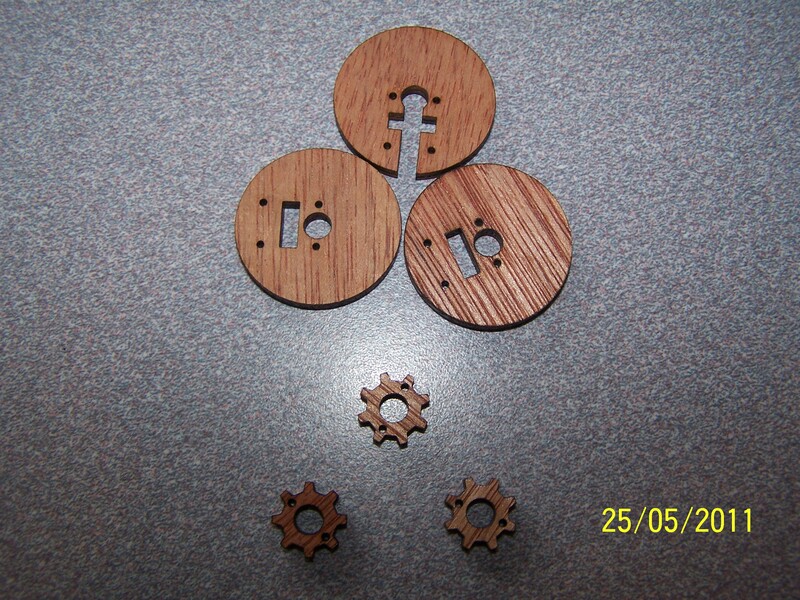 On a side note I’ve listed some printed parts for sale on eMAKERshop. 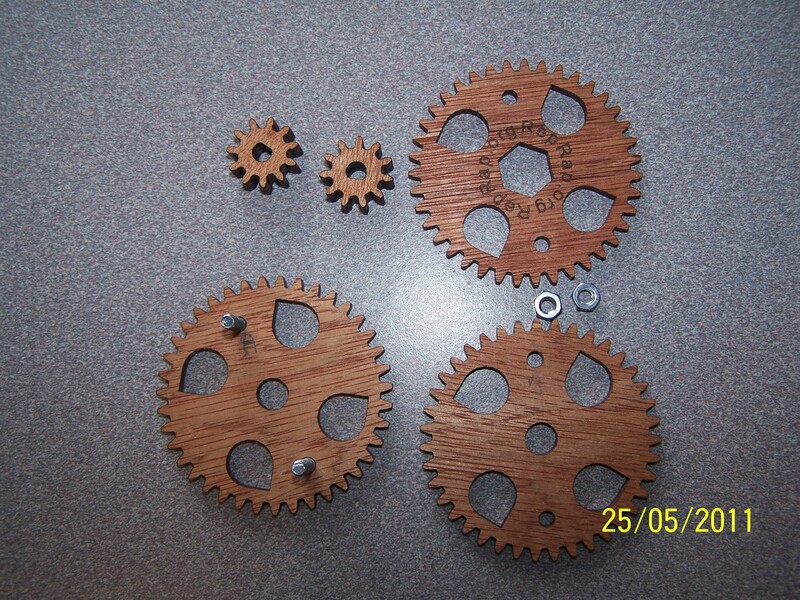 Also eMAKERshop are rasinig funds to sell Huxley kits here: http://igg.me/p/26971?a=130847&i=shlk.